We love itsubmitted by Daniel C. - Mar 20, 2019 |Recommended: YesWe love this apartment complex. Its in the middle of Temple, so great location, yet its peaceful and quiet. The staff have been friendly and amazing. We had a leak under our sink and maintenance was out in less than 15 mins after hours to fix it. The landscaping and pool are very well kept, clean and beautiful. We have had zero issues with other residents, we have actually made a lot of friends. Only thing i would change is updating the windows to a better quality, adding a dog park and ideally adding a small playscape for kids. It's a very peaceful environment, perfect for all renters who work long hours or retired.submitted by Desta G. - Feb 28, 2019 |Recommended: YesI will tell them that it feels like being in the suburb, and yet right in the middle of everything that you would need to access within one to two miles of driving. It is nice for the pricesubmitted by Ella M. - Nov 27, 2018 |Recommended: YesIt is very quiet. At times there are people who ride through with music playing loud or with loud cars but they are not the majority. I love that you can not hear your neighbors...at all. The only time I hear my upsets neighbors is when they are moving quickly. The neighbors next door I do not even hear them. The buildings themselves could use an upgrade. They could use new doors and windows. The price is very good for what you get. 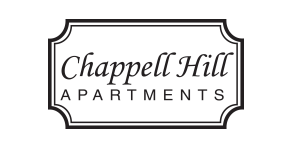 A Nice Place to Call HOMEsubmitted by Maria H. - May 23, 2018 |Recommended: Yesoverall I am at peace and feel safe to be a tenant at Chappell Hill Apt. It is nice with all the treessubmitted by Curtis M. - Apr 19, 2018 |Recommended: YesI like it because it has a lot of trees and it is pet friendly. A Place to Call Homesubmitted by Deborah L. - Mar 01, 2018 |Recommended: YesMonica and Bridgett make this place feel like home. They are always ready with a smile and pleasant greetings and to help in anyway they can to accommodate your needs while answering any questions you may have for them. When you have a maintenance issue they handle it right away with competent and well trained personal who are always polite. The property is very pet friendly with pet stations. The neighbors are friendly and it is very quiet. A place I can call home submitted by Rachel M. - Feb 05, 2018 |Recommended: YesI've loved my time at Chappell Hill. I've enjoyed getting to know the community of residents and I feel very safe at all hours of the day. Nice property with friendly managementsubmitted by Jeremy M. - Feb 01, 2018 |Recommended: YesI have lived here for two years. The apartment manager is very friendly. Maintenance is quick to deal with any issues and generally does a good job. I have had relatively few issues with bugs getting in an odd cricket or spider every few months . The property is beautiful and very quiet for being right by I-35. It is sometimes hard to find a parking spot, and the landscapers are loud outside my window early in the morning once in a while, but overall I have enjoyed living here.